Natural gas production in the Permian Basin has also grown in recent years, largely in the form of associated gas accompanying the region's rising crude oil production. Similar to the Appalachian Basin, natural gas in the Permian trades at lower prices relative to Henry Hub because of regional infrastructure constraints. A number of new natural gas pipelines are planned or under construction that will help move natural gas out of the region, and several of them will expand liquefied natural gas export capability. 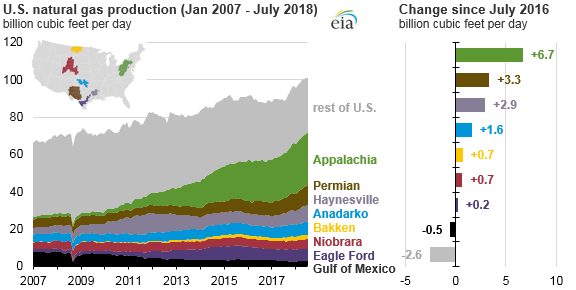 EIA projects that July 2018 production in the Permian Basin will account for about 11% of total U.S. gross production.